Media “archaeologies” often emphasize the technical similarities between nineteenth-century optical devices and the basic mechanism of film animation: both create the illusion of movement by deploying series images stroboscopically. The designation of such instruments as “pre-cinematic,” however, can be misleading. As Donald Crafton has pointed out in “The Veiled Genealogies of Animation and Cinema” (Crafton 2011), focusing on technological kinship alone can create a false sense of teleological continuity that masks these instruments’ uniqueness as well as the distinct historical and cultural meanings that their moving images evoked. 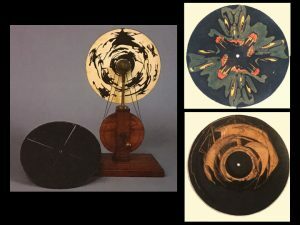 This post explores two frequently overlooked contexts for the emergence of the earliest such “philosophical toy,” the phenakistiscope, a whirling, slotted disc that when spun produces a spectacle of movement based on serial images painted, drawn, or printed around its periphery. The first concerns visual “latency,” the now debunked theory that the retina retains perceived images for brief periods of time. It was an effort to calculate the duration of this persistence—to measure stillness rather than to generate illusions of motion—that led Belgian physicist Joseph Plateau (1801-83) to develop the phenakistiscope in 1832. 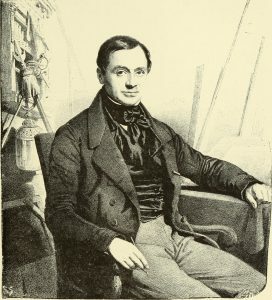 The second involves Plateau’s collaboration with Jean-Baptiste Madou (1796-1877), the painter and lithographer who designed and executed some, and possibly most, of the early phenakistiscope discs. As a visual artist working in the shadow of another contemporary invention, the photograph, Madou may have had his own reasons for wanting to explore the temporality of seeing. Such contexts help to reveal the phenakistiscope and other optical devices as hybrid forms, the result of advantageous cross-pollinations among science, aesthetics, entertainment, and other discourses frequently presumed to be disconnected or autonomous. More broadly, they point to a larger, messier, and more comprehensive history of “moving images” as a development of diverse expressive forms, including, of course, film animation. In that sense, reconsidering the origins of the phenakistiscope might create possibilities for a more rigorous scholarly apprehension of film animation itself as a part of this complex historical landscape. From the moment it is defined as an “animation” device, the phenakistiscope becomes detached from its material origins in nineteenth-century investigations of “persistence of vision.” Plateau’s doctoral thesis, a 27-page tour-de-force submitted in 1829 to the Faculty of Sciences at the University of Lieges, initiated a long series of experiments on visual latency (Dorikens 2001, 164). 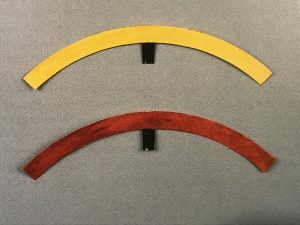 To determine how long an observed image persists on the retina, for example, he devised 90-degree color arcs, mounting them on a black disc and rotating them at accelerating speeds. Observing the rate threshold at which viewers perceive a full circle enabled Plateau to calculate the persistence effects for different colors: 0.35 seconds for white, 0.32 seconds for blue, and so on (Dorikens 2001, 28). Plateau reasoned that this persistence accounted for common perceptions of movement, such as when we see falling raindrops as parallel streaks and shooting stars as long trails in the sky (Dorikens 2001, 165). Plateau’s color arc observations led him to construct a series of experiments using translucent mathematical curves mounted on black discs. Superimposing the discs and revolving them in opposite directions and at varying speeds produced at the intersection of the arcs a traveling “locus” of brightness that traced virtual “light drawings” before the viewer (Plateau 1828, 393). Figure 5. Plateau’s optical locus instrument with four locus discs. 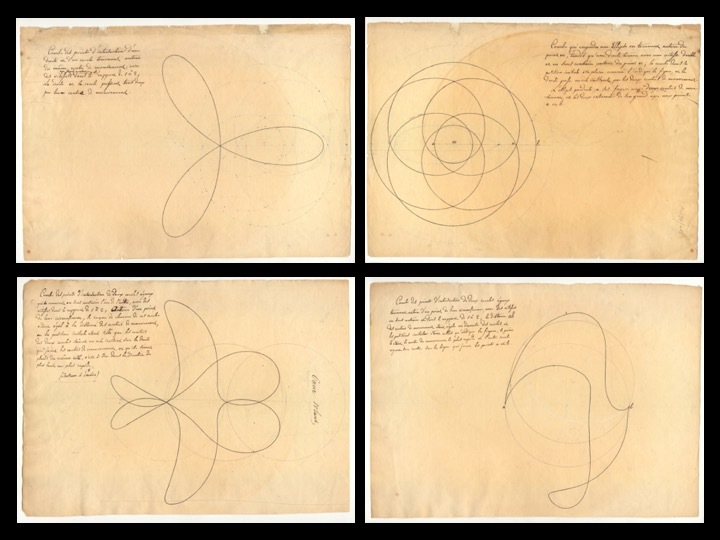 Paired discs mounted in various combinations at a and b produced “light drawings” which Plateau transferred to paper as pen and ink tracings using mathematical formulae. As these images demonstrate, Plateau was beginning here to contemplate the optical temporality of figure formation and deformation, that is, how long it takes the biological apparatus of vision to perceive an image as objectively present and stable. 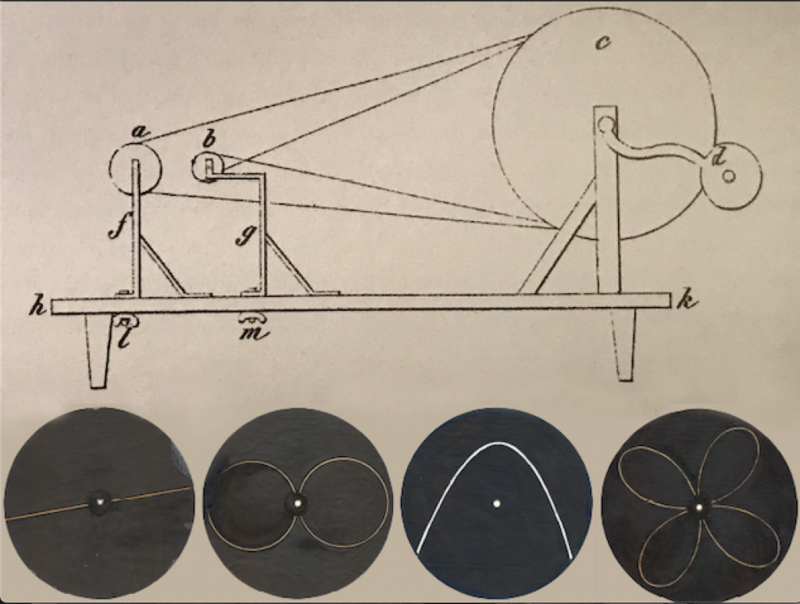 These experiments resulted next in the development of the anorthoscope in 1829-30, an apparatus combining two discs, one inscribed with a mathematically distorted image and the other fitted with a slot as an aperture for viewing. Rotated in opposite directions and at precise speed ratios, the instrument enabled the eye to perceive a stationary, corrected image (Plateau 1830, 121; 1836, 7). In 1832, Plateau published a brief article, “Sur un nouveau genre d’illusions d’optique” (“On a new kind of optical illusion”). 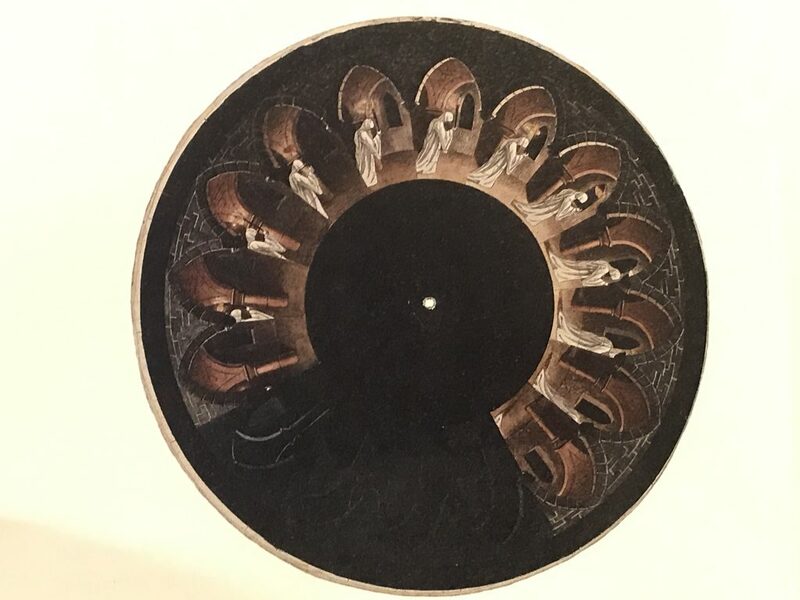 In it he described an instrument comprised of a single slotted disc that when rotated and viewed in a mirror produced the spectacle of a pirouetting dancer, the result of progressed series images drawn around its perimeter. Curiously, this description of the as yet unnamed phenakistiscope appears almost as a coda, a sort of illustrative flourish designed to amplify Plateau’s actual purpose in the essay, which was to establish the authority and primacy of his research on visual latency. 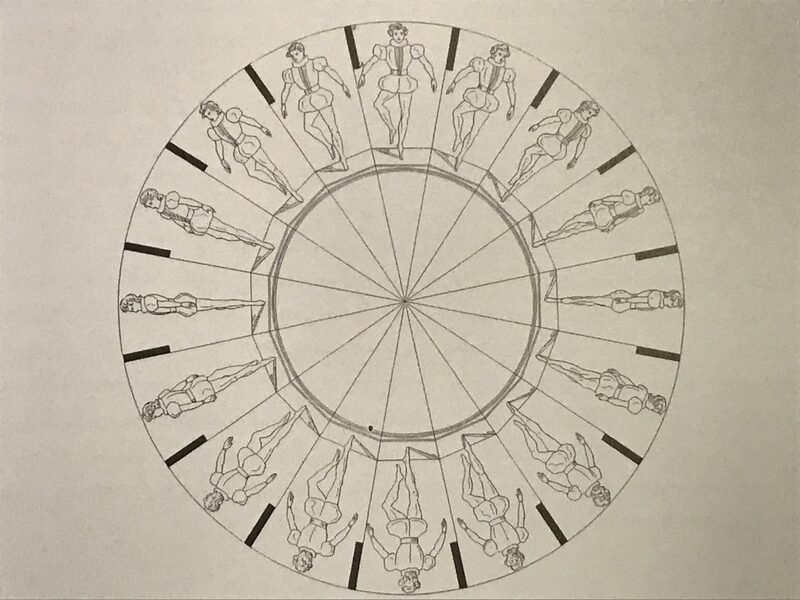 Plateau opens his piece by describing a different disc, one with 16 slits and 16 sectors in which identical figures—not the progressed series images of the dancer—are drawn (Plateau 1832, 365-68). As in the color arc, loci, and anorthoscope experiments, this apparatus, when activated and viewed in a mirror, produces the spectacle of a stationary figure, composited from those rotating on the disc. It is only in the penultimate paragraph of his essay that Plateau introduces the notion of progressed figures in series, the pirouetting dancer delivering the final coup-de-grace in what amounts to a rhetorical exercise in professional swagger. Plateau himself appears to have regarded the phenakistiscope’s motion effects as a mere curiosity, the ancillary effect of his researches on visual latency; when approached by the London-based Ackermann printing company and others interested in mass-marketing the device, he freely surrendered the designs to their use without restriction (Plateau 1833, 489). It fell instead to his collaborator Jean-Baptiste Madou to explore the instrument’s potential as an aid for further studying the temporality of seeing. Married in 1833 to the stepsister of Plateau’s close friend and mentor, the Belgian astronomer and mathematician Adolphe Quetelet, Madou met Plateau at the height of the latter’s engagement with visual latency (Dorikens 2001, 168). Madou supplied imagery for the phenakistiscope, but his work with Plateau suggests that he may also have had personal reasons for taking an active interest in the device’s implications for visual perception. 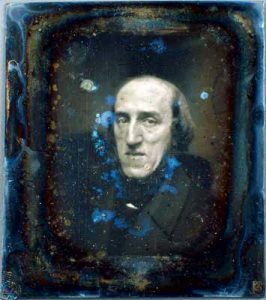 For visual artists of the time, the event that most vividly demonstrated seeing as a temporal faculty was the emergence of the photograph in the late 1820s. Reliant on exposure times approaching eight hours, early photography provided material confirmation not that the world is as it is seen so much as that perception is influenced by changes in light over time. The pressure the new technology brought to bear on young painters like Madou was thus not that of perfecting visual realism but that of exploring visual temporality. Madou’s career provides clear evidence of an artist whose vision was firmly and consistently rooted in a temporal consciousness; his drawings, paintings, and prints frequently depict human figures in time, captured in living moments of vitality and temporal duration. Images such as this one are not simply narrative in content; they also place a formal emphasis on the moment of perception itself, the temporal dimension in which light, operating in the manner Plateau’s loci experiments had demonstrated, draws an image on the eye. Figure 10. Madou, anorthoscope disc depicting a creature blowing coals. Two discs in particular suggest that Madou found in his work with Plateau an opportunity to explore this temporality of seeing. Combining the open aperture of the anorthoscope with the phenakistiscope’s stroboscopic capacity to make images available to the eye for very short intervals, Madou conceived two novel discs, the first depicting a creature blowing coals into flame and the second showing a monk passing among the columns of a cloister while carrying a lighted torch. The primary “movement” depicted in these discs is that of intensifying and decreasing illumination, that is, changes in light over time. Figure 11. Madou, phenakistoscope disc depicting a monk in a cloister. 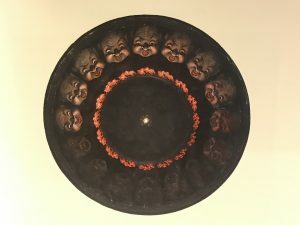 While it is difficult to draw any definitive conclusions from these discs alone, the strikingly unique character of the motion they depict suggests they may have played a role in Madou’s explorations of perception as subject to time. At the very least, they demonstrate that in his work with Plateau, the painter was far from a passive collaborator and that intellectual labor is anything but a solo endeavor. 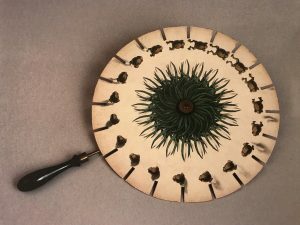 The phenakistiscope, like Plateau’s other spinning devices, emerged out of a broad interest in visual latency; it took shape under the influence of scientific, aesthetic, cultural, material, and economic discourses that form the complex, intersecting, and often unseen contexts of nineteenth-century visual culture. Acknowledged as such, phenakistiscopes and other optical devices appear as material witnesses not to an early age of “animation” that in all respects but its primitivism resembles our own, but rather, to a rich and complex conversation between science and art that has been, like philosophical toys themselves, subject to anachronistic thinking. In this context, Plateau’s collaboration with Madou suggests the importance of approaching all forms of moving image technology, including film animation, not as the descendants of a rigidly linear history but as the diverse expressions of an endlessly fascinating, complex, variegated, and heterogeneous genealogy. Nicholas Andrew Miller is Associate Professor of English and Director of Film Studies at Loyola University Maryland. His areas of teaching and scholarly interest include film animation, early cinema, the intersections between modernist print and visual cultures, and twentieth-century Irish and British literature. He is currently at work on an interdisciplinary study of metamorphosis in modernist visual culture. He is the author of Modernism, Ireland, and the Erotics of Memory (Cambridge, 2002). Crafton, Donald (2011).“The Veiled Genealogies of Animation and Cinema.” Animation: An Interdisciplinary Journal 6, no. 2: 93–110. Dorikens, Maurice (2001). Joseph Plateau 1801-1883: Leven tussen Kunst en Wetenschap/Vivre entre l’Art et la Science/Living between Art and Science. Provincie Oost-Vlaanderen: Universiteit Gent. Plateau, Joseph (1828). “Sur les apparences que présentent deux lignes qui tournent autour d’un point avec un movement angulaire uniforme” (“On appearances presented by two lines turning around a point with a uniform angular movement”). Adolphe Quetelet, ed. Correspondance mathématique et physique t.IV: 393. Plateau, Joseph (1830). “Lettre relative à différentes experiences d’optique (Lieux des intersections de deux lignes tournantes, anamorphoses par rotation)” (“Letter relating to different optical experiments [places of intersections of two rotating lines, anamorphoses by rotation]”). Adolphe Quetelet, ed. Correspondance mathématique et physique t.VII: 121. Plateau, Joseph (1832). “Sur un nouveau genre d’illusions d’optique” (“On a New Kind of Optical Illusion”). Adolphe Quetelet, ed. Correspondance mathématique et physique t.VII: 365-68. Plateau, Joseph (1833). “Sur la persistence des impressions de la rétine” (“On the Persistence of Impressions on the Retina”). M. Verhulst and Quetelet, tr. Traité de la lumière (Treatise on Light). Paris: Hachette, t. II, supplement: 489. Plateau, Joseph (1836). 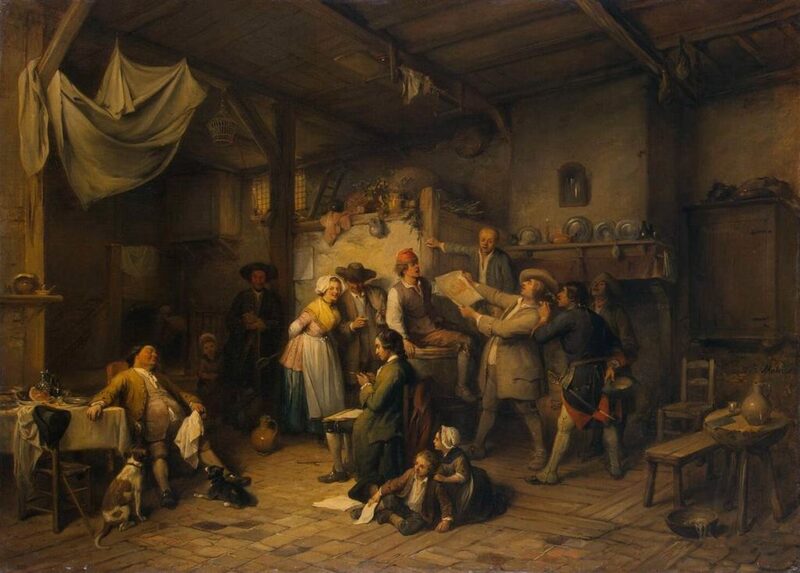 “Notice sur l’anorthoscope, instrument de son invention” (“Notice on the anorthoscope, instrument of its invention”). Bruxelles: Bulletins de l’Académie royale des sciences, des lettres, et des beaux-arts de Belgique, t. III: 7.